New Azerbaijan postage stamps 2016. 25th anniversary of the RCC – Regional Commonwealth in the field of Communications. .N 1245 - 50 qapik. 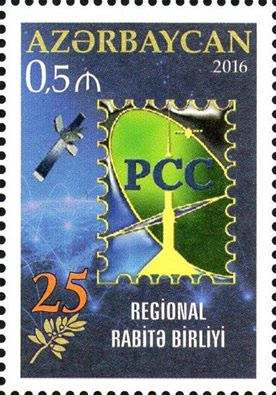 The stamps is devoted to the 25th anniversary of the RCC – Regional Commonwealth in the field of Communications. New Azerbaijan postage stamps 2016. 60th anniversary of the television broadcasting and 90th anniversary of the radio broadcasting in Azerbaijan. N 1244 - 50 qapik. 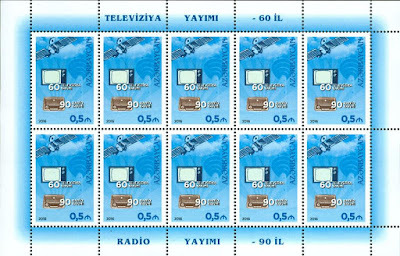 The stamps is devoted to 60th anniversary of the television broadcasting and 90th anniversary of the radio broadcasting in Azerbaijan. 25.01.2016. Europe 2016. Think green. N 1241 - 20 qapik.The edge of stamp are grey. N 1242 - 60 qapik. The edge of stamp are green. Souvenir sheet: N 1243 - 1 manat. 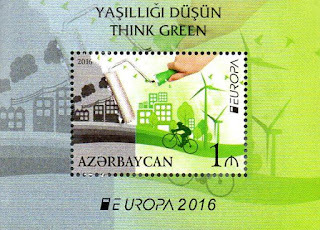 The stamps and souvenir sheet is devoted to the joint project of Post Europe - “Think green”. Booklet: N 1241a-1242a - 20 and 60 qapik.